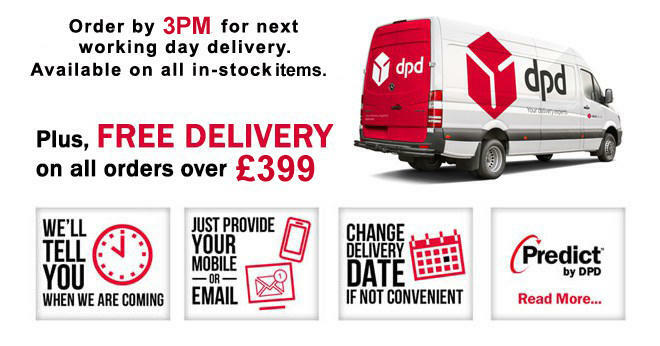 All our deliveries to Mainland UK and Ireland are sent out using DPD & DPD local. Any parcels sent Internationally will be sent using a secure and safe courier but we will always try to get the best price for you so the courier may change. Items purchased Monday-Thursday before 15:00pm in mainland UK should expect to see their goods the next day. If items are purchased on Friday before 15:00pm, you should expect them to arrive on the following Monday. Deliveries outside of Mainland UK can take 3-7 days. For further information, contact us. If you have placed an order which you need for a job the following day, we can send parcels out to arrive with you before 10:30am or 12:00pm. This service does cost more than the normal next day delivery and is only available in certain parts of Mainland UK. For further information, please contact us. Saturday and Sunday deliveries are available at additional costs, these will need to be discussed with us as the costs may vary based on size, weight, and destination etc. We can provide services in which the items are on a guaranteed time slot, so if you desire your items to arrive before 10:30am or 12:00pm, we can arrange this. We can send items globally. Please allow us time to generate quotations for the cost. Additionally, we do not send items out uninsured. Insurance will normally be included in the shipping quotation. Please get in touch with us to arrange this.